There are three things in this world for which my children go bananas, and popcorn holds the coveted number one spot on that list. So, I decided to be a cool mom and made them a huge batch of this delicious and healthy peanut butter banana popcorn. Yahoo! Guess what? My trickery worked. I may or may not bribe them with this stuff. It’s like a bowl of gold to them. Literally and figuratively. Now, let’s get to the super fun part and talk about nutrition and health and all that mumbo jumbo. I recently read an article talking about the health risks associated with bagged popcorn. It’s not the actual popcorn which poses a threat, but the chemical in the nonstick lining of the bags, called PFOA. It has been linked to to an increase in certain types of cancer, namely liver and prostate cancer. Sure, it’s a minor link, but the amount we consume alarmed me when I read about it. So, what’s the fix? MAKING YOUR OWN POPCORN! It’s more fun, anyway, and you can make your own fancy combinations. Also, you should make your own popcorn if you follow a dairy-free or plant-based diet. We all know I love butter. (It’s this blog’s name, for great Aunt Sally’s sake!). However, I always make my popcorn with coconut oil. I like the light flavor it gives the popcorn. 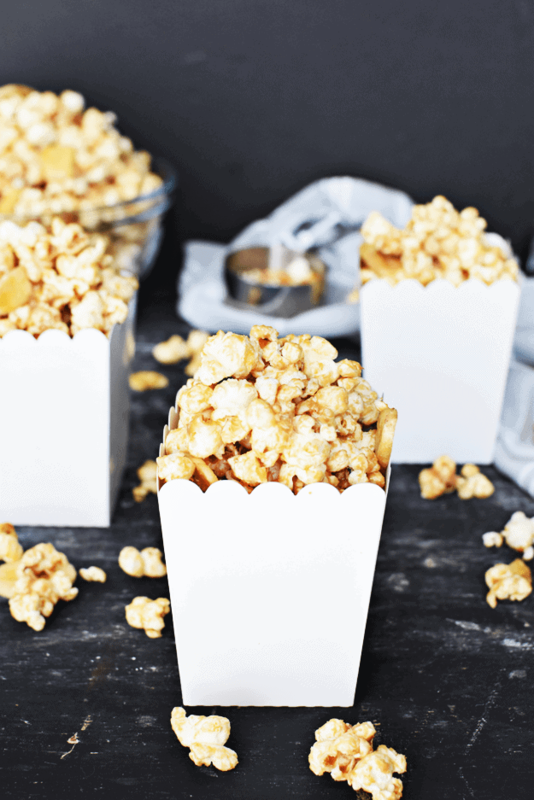 Not to get all popcorny on you, but this peanut butter banana popcorn is a healthy treat to go peanuts and bananas for. And it only takes 10 minutes total to make! 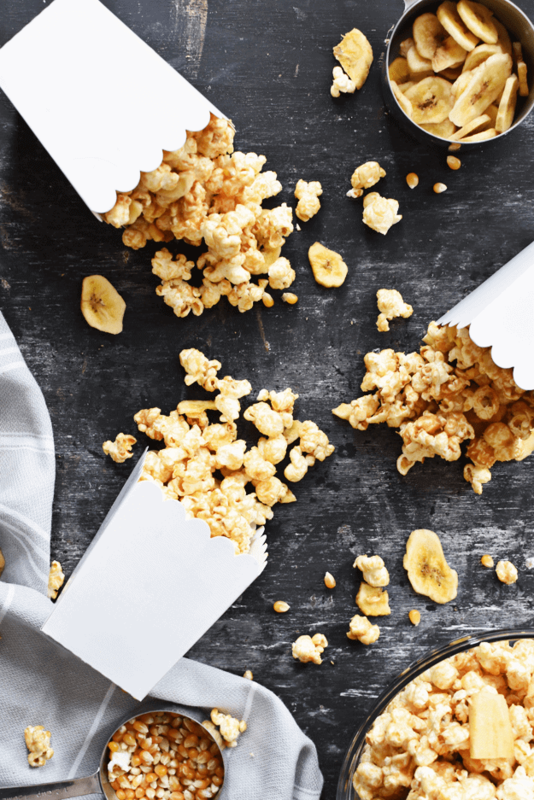 Pop some up tonight in celebration of National Popcorn Day, or save it for this weekend’s movie night. Grab the recipe below, and enjoy! 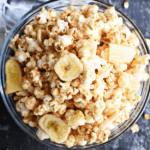 Healthy peanut butter banana popcorn is a quick treat to make for the family. Whether it's for a snack or a movie, this will be a recipe to go peanuts over. Heat coconut oil in a large pot on the stovetop on medium-high heat. Add in kernels and cover. 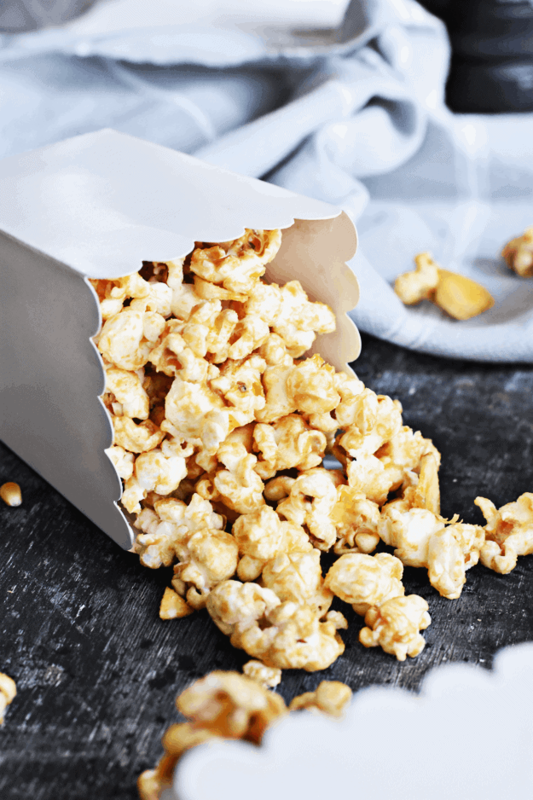 Allow kernels to heat and pop, about 1-2 minutes. Remove from heat. In a small mixing bowl, whisk together peanut butter, agave, and vanilla. If it is too thick, you may microwave it for 30 seconds to get it more runny. 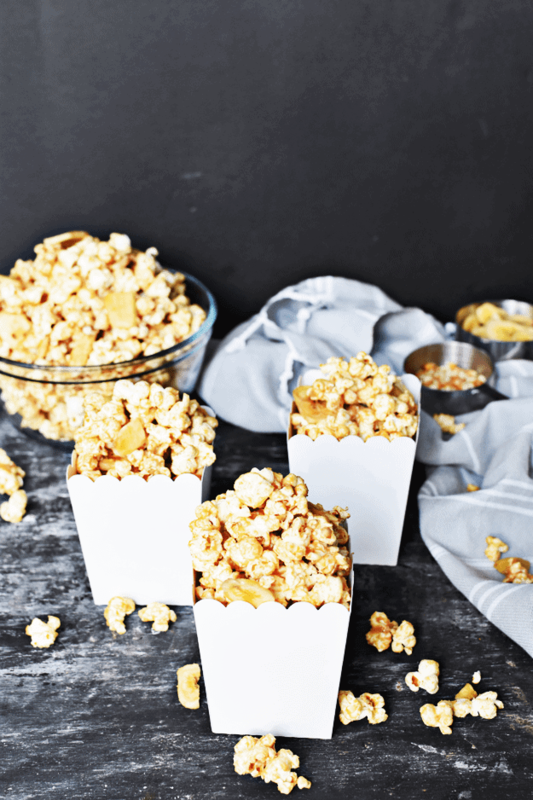 Pour the popcorn in a large bowl, and stir in the peanut butter mixture until it is thoroughly covering the popcorn. Add in banana chips (you can crush them into smaller pieces if desired) and sprinkle with salt. Enjoy! You can use high fructose corn syrup or honey in place of agave nectar. Substitute with almond butter for peanut allergies. For more healthy treat recipes like this, try these no-bake vegan chocolate fig bites, or these no-bake almond butter bites. All of my favorite flavors in this popcorn!